Solar storms are sparking spectacular displays of ‘Northern Lights’ on planet Jupiter that are hundreds of times more powerful than Earth’s aurora borealis. They are also about eight-times brighter than what is normally experienced over a large area of the planet. Scientists from University College London (UCL) have published new research this week based on data collected from NASA’s Chandra X-Ray Observatory. 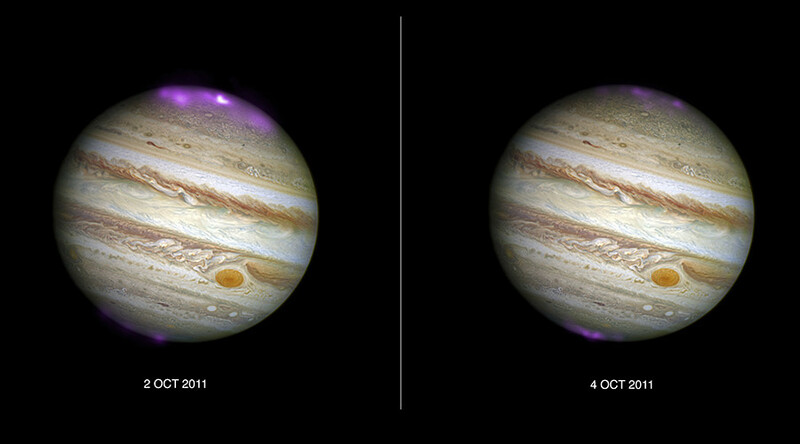 They studied the impact of a giant solar storm on Jupiter’s auroras in X-ray light. The goal of the research is to analyze the interaction of Jupiter’s ‘magnetosphere’ and the solar wind and its effect on the giant planet, according to lead author William Dunn. The sun is constantly releasing flows of particles into space, when giant storms known as coronal mass ejections (CME) erupt, strong winds can interfere with this and compress Jupiter’s magnetosphere. Researchers tracked the impact of the giant storms on Jupiter’s aurora by monitoring the X-rays emitted during two 11-hour observations. They found that these collisions are behind Jupiter’s X-ray Northern Lights, which covers an area bigger than the Earth’s surface. The research team now hopes to discover how the X-rays form by collecting data on Jupiter’s magnetic field, magnetosphere and aurora using the Chandra observatory and European Space Agency’s XMM-Newton observatory.